Are you a social media virgin and still scared to enter a whole new digital world? Or are you using social media for your business but not yet seeing the benefits from it? Want to know how you can make your company’s social media content more engaging for your audience? Read on to find out some key ways that you can improve your content on social channels and reap the benefits with increased website traffic and ultimately more sales! Which Social Platforms Are Appropriate For Your Business? There are lots of social media platforms to choose from, so firstly how do we know which ones are right for our businesses? If you are completely new to the social realm, we recommend you choose one or two channels to start you off. We will have a look at just a few of them. One of those most used and recognised platforms. Quick and easy to use with a 280 character limit making it a brief but punchy way of reaching your public. Hashtags are a hash sign (#) followed by a word or phrase used on social media channels, particularly Twitter (Oxford Dictionary 2018). They are useful in helping your target audience find your posts, as users search and identify messages on a specific topic; for example, we commonly use the hashtag #promotionalproducts. Similar to Pinterest, Instagram is a visual social platform which is great for business selling products, particularly for fashion, beauty, food and homeware organisations.Founded in 2010, more than 40 billion photos have been shared in the Instagram history, and around 95 million photos are uploaded per a single day (Past Book 2017). Firstly what type of viewers are you aiming to target? This will give you a better idea of what to Tweetor post about. A thing that you should remember when posting on social media is that it needs to be a focussed message and be of use to your captive audience. No one likes a post that is all about me me me me me! So try to engage your clients by showing interest in what interests them. Really get to know your audience and what makes them click. Mix up your posts including statistics relating to your industry. It might also be interesting for your audience if you shared any suitable and current news articles related to your industry or products. It is a good idea to use articles from well-established newspapers like The Independent, which is a trustworthy and reliable source for your audience, reflecting positively on you as a business. For more visual social media platforms such as Pinterest and Instagram, it is also a good idea to create some bold, colourful graphics to state facts and statistics in a visually pleasing way. Keep it Light-Hearted! Depending on what industry your company is in, as a general rule it is important to keep your content a little bit more informal on social media, compared to how you would usually interact with your customers via email for example. Posting funny, relevant or timely jokes and ‘memes’ can also help to keep the tone more relaxed, but you need to be careful not to cross the line into inappropriate. Sharing tips is another good one. Not only are you promoting a product, but at the same time you can give great advice on how to use the item, this will give more value to your post and really connect you to your customer. Have a think about a ‘shoulder niche’ that your customers might be interested in; a niche that’s closely related to your company’s main topic (Neil Patel 2018). 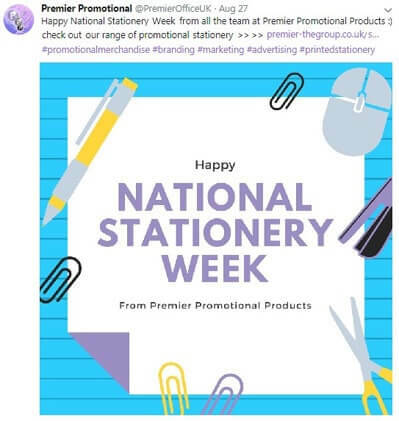 For other great social media content ideas, why not use relevant national awareness days to your business, for example we recently posted for National Stationery Week with a link to our promotional stationery product range. This helped to draw more traffic to our website and increase brand exposure. Everyone needs a bit of #MondayMotivation when starting back at work after a heavy weekend! Tap into the needs of your customers and use a motivational quote or some #wordsofwisdom on a Monday morning. This will help to promote positivity and inspire and encourage customers to work hard, even if they are falling asleep at their desks! People love viewing video content, so if you have the resources, where possible you should create some high quality, engaging and concise videos. If you do not have the resources to create excellent quality content – just film on your smart phone and download an app to put the videos together for you! If you need help choosing an app, check out this article with a shortlist of the best, free video editing apps. Videos that you upload to YouTube can then be shared across all other social channels at a later stage, enabling you to reach an even wider audience. Visual aids are often a good way as this keeps clients’ attention captured. Did you know that On Twitter, a video Tweet is 6 times more likely to be retweeted than a photo Tweet, demonstrating the increasing importance of video as a media tool to engage your audience. 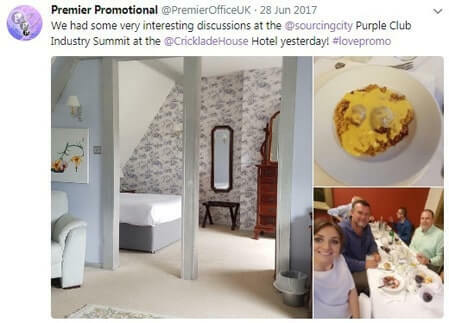 If your company is going on a day out, then tweet about it! It is great for your customers to see what you get up to, and photos of employees help to personalise your relationship with clients, particularly if you are predominantly an online business or mainly deal with clients over the phone. It is a good idea to tag locations and other companies in your posts, as this will help you gain further exposure and you might even get a retweet/ repost! Also show off any internal business or staff achievements by sharing this with your followers! Also help your customers to promote themselves by retweeting/ reposting any of their content that is relevant to your page. We often post on Twitter and Facebook, thanking customers for their recent order or about a customer visit we have been on. For reposting content on Instagram check out this article with a roundup of the best Instagram repost apps for 2018. What is a hashtag? According to Wix (2018) “A hashtag is a keyword or phrase preceded by the hash symbol (#), written within a post or comment to highlight it and facilitate a search for it”. Why should you use hashtags? Because every single minute, social media users are posting thousands of images across all platforms and so using hashtags are an efficient way of targeting a specific group of people and standing out from competitors. They also ensure that your posts aren’t limited solely to the individuals who already follow you; it broadens your reach to potential customers or new followers. In 2010 Theo Paphitis, who is well known from starring on Dragons’ Den, created the hashtag #SBS also known as Small Business Sunday. Every Sunday between the hours of 5.00pm and 7.30pm, small businesses can Tweet @TheoPaphitis, describing their business and using this hashtag for the opportunity to be one of six winners who are announced to Theo’s 500,000 followers every Monday night at 8pm. If you happen to be one of the lucky winners, not only will this help to increase your followers, but your Company is also likely to reap the benefits when this positive media publicity translates into sales growth for your brand. Try out some different social media campaigns involving your new products, to help raise your profile and get your name out there more. For example our recent ‘Atomz Sweets’ Twitter campaign encouraged customers to share our post in return for some free sweets delivered to their office… who doesn’t love a free sweets giveaway! Alongside the social media campaign, you could always create a video or blog post as well to further promote your products and services. What is a call-to-action? A call to action (CTA) is a prompt that actively asks potential customers or followers to take action (Optimizely). It is a good idea to finish a post with a call-to-action, where suitable, as it helps to inform your audience about what they need to do next. This ‘food for thought’ can be in the form of a question; “how could you incorporate ___ into your business plan?”, or a request such as “sign up to our newsletter” or “to find out more, please contact us on 01732 843250”. This will generally be followed by a hyperlink or a button to enable your audience to complete this action. By actively asking followers and potential customers to take action, you are likely to improve your conversion rate for campaigns and untimely help with sales growth for your organisation. It is important to keep track of which posts get the most engagement from your audience. Most social media platforms have their own analytics and insights trackers to help you with this (examples of how to find these below). So just to sum up, the powers of social media are endless, so choose your words wisely and keep your audience engaged and the benefits will be rewarding to your business. When choosing what to talk about, the world is your oyster as there are so many topics, facts, famous birthdays and current issues you can put across to your customers. Make sure you shake things up and keep topics fresh, interesting and current for your target audience. Whilst you can be direct with your message don’t get too serious and try to put some light hearted fun facts and jokes, to keep your clients entertained.